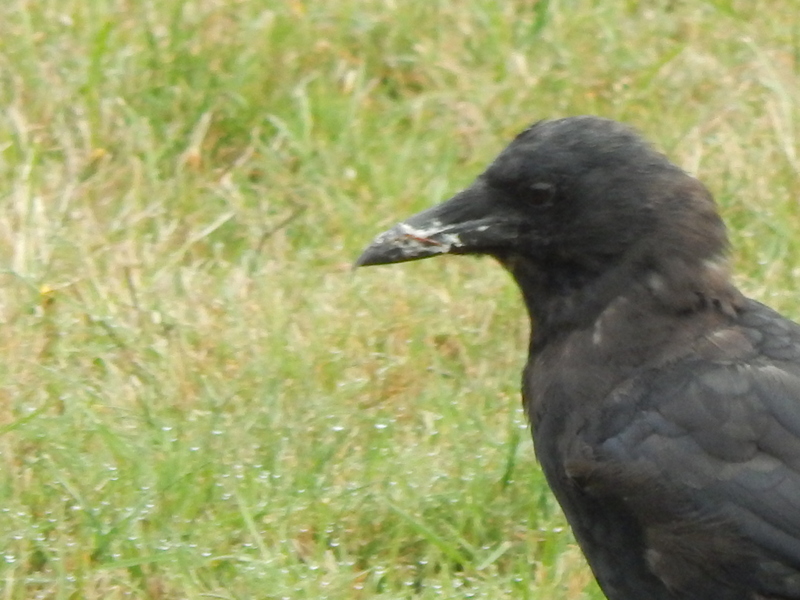 What the heck got on this crow’s beak? From a distance I thought he might have some disease. When I got home and looked at this zoomed picture you can see it is sticky. A piece of grass or pine needle is even stuck to it. What was this little guy digging in? He acted like a youngster so perhaps he put his nose in someplace he shouldn’t. He and his family are only a block from the Arbor Heights Elementary which is being demolished. Is it construction gunk? One more thing – see how this crow’s neck feathers are still in molt mode. Kind of distressed and thin makes him look even more unkempt. you might be right! I didn’t think of that. now he needs something greasy to get it off. Probably wear off. Or he will rub it all over stuff like tree trunks and grass. The problem is, he might like it so much, he hunts up more, on the underside of tables and the edges of sidewalks and gutters. Or maybe not. I don’t think gum is as popular as it used to be. 🙂 I think he will be OK. Crows are clever.